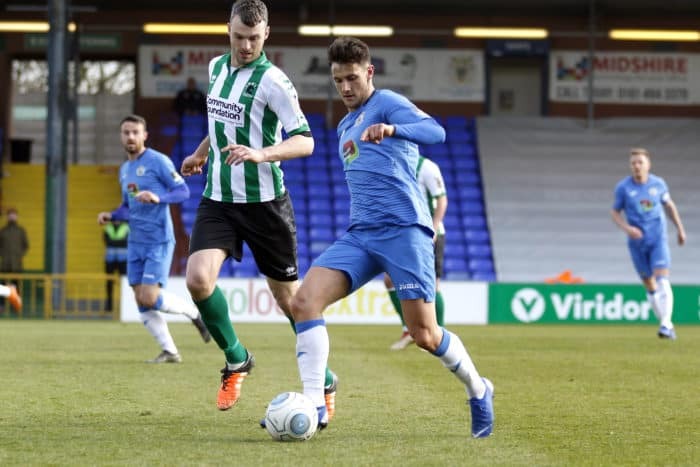 County’s nine-match winning home run in the National League North came to an end with a first defeat at Edgeley Park for more than seven months, as in-form play-off chasers Blyth Spartans completed a ‘double’ over the table-toppers. 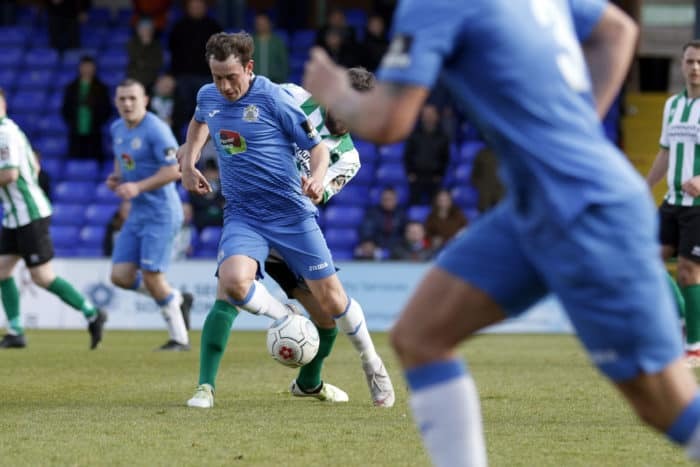 But, thanks to Chorley’s reverse in an eight-goal spectacle 10 miles west in Altrincham, the Hatters hung on to their one-point advantage as league leaders, ahead of visiting Victory Park to face the second-placed ‘Magpies’ in a potential title-decider on Easter Saturday. County took to the field in SK3 showing two changes from the starting line-up at Chester four days earlier. Sam Minihan and Matty Warburton dropped to the bench, as they made way for Dan Cowan and Jordan Keane – with a 4-3-3 formation operating at the outset against the attack-minded Spartans. And attack the visitors did, as they forced a couple of corners within the opening five minutes – although County fashioned the first chance of note shortly afterwards, when Adam Thomas squared from the right to Paul Turnbull, and the skipper’s lay-off for Darren Stephenson was drilled narrowly wide of the near post. The Hatters earned their first corner after 13 minutes, and it almost brought them good fortune, as Turnbull’s delivery from the left was headed towards goal by Stott – but was blocked. For all that, County bore the look of a somewhat nervy and disjointed unit – and when visiting skipper Robbie Dale dispossessed Cowan on the halfway-line with 17 minutes played, before advancing to the edge of the area and firing wide, it should have served as a warning. And just two minutes later, the Spartans struck what was to prove the contest’s decisive blow. 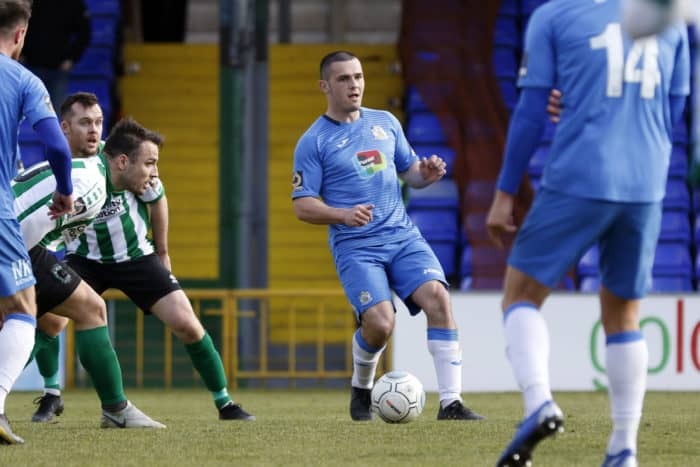 Kieran Green picked out Dan Maguire in the County box, and Blyth’s leading scorer, under pressure from Ash Palmer, took a touch before left-footing home into the bottom-right corner. County sought, in response, to breach a visiting defence that had conceded more goals than any other team outside the league’s bottom five – but without success, as Turnbull’s looping half-volley was tipped over by goalkeeper Peter Jameson, Palmer nodded the resulting corner wide of the left upright, and Nyal Bell headed a Sam Walker cross from the left beyond the opposite post. 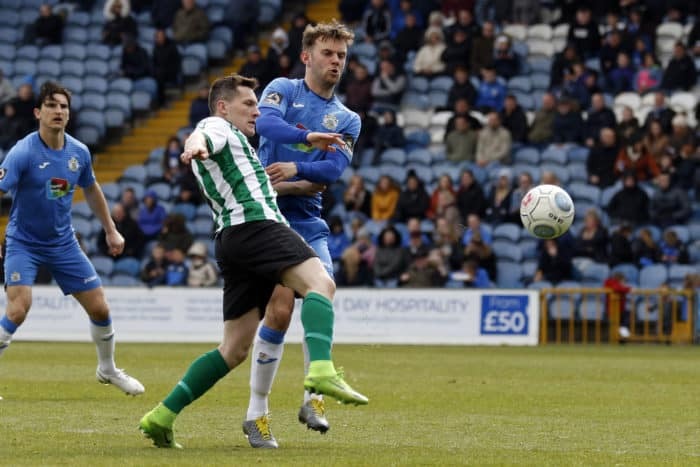 And four minutes before the break, only the legs of Ben Hinchliffe saved the Hatters from going in two-down, as, following another Blyth counter-attack, County’s Number One kept out at point-blank range a first-time shot by Maguire from Jarrett Rivers’ cross on the right. HALF-TIME: County 0, Blyth 1 (Maguire, 19). The Hatters had already switched the formation to their more usual 4-2-3-1 ahead of half-time, and they continued in that vein upon the resumption with the joint introduction of Warburton and Elliot Osborne – making an encouraging start to the new half with two corners in as many minutes. 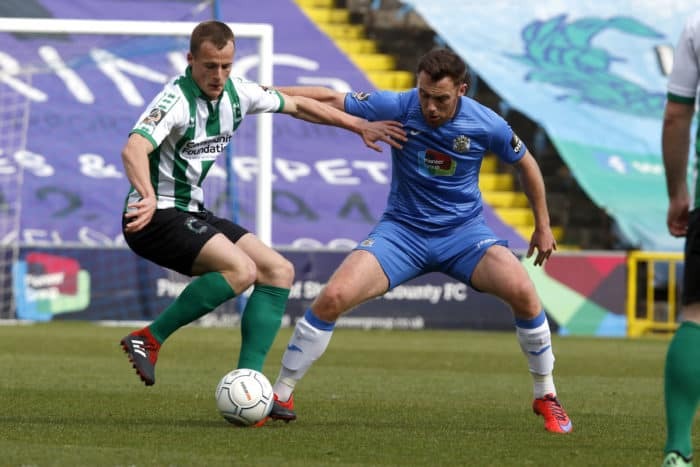 But Blyth continued to threaten on the break – and just five minutes after the re-start, they could and should have doubled their advantage when Rivers met Maguire’s cross from the right, only to strike the crossbar from close range with the goalmouth gaping. As the hour struck, County came close to levelling – after Scott Duxbury’s deflected cross from the left found Warburton, whose first-time prod towards goal was palmed off the line by Jameson. The end-to-end fare continued with little to report by way of cutting-edge action in either final third until the 90th minute, when Frank Mulhern, 10 minutes following his introduction, cut in from the left and unleashed a superb angled shot that glanced off the bar. FULL-TIME: County 0, Blyth 1 (Maguire, 19). Team: Hinchliffe, Cowan (Osborne, 46), Duxbury, Keane (Warburton, 46), Palmer, Stott, Thomas, Turnbull (Capt. ), Bell (Mulhern, 80), Walker, Stephenson. Man of the Match: Turnbull.